Type: BOOKS. Detail: Raetsky & Chetverik. Product Code: 9781857445374. Category: OPENING KPS. Publisher: Everyman. The Classical Sicilian is one of Black's most popular and highly regarded opening choices against 1 e4, and it's been a favourite of such greats as Vladimir Kramnik, Alexei Shirov and Vishy Anand. White has a number of aggressive ways to battle against the Classical: the fashionable RichterRauzer Attack; Bobby Fischer's favourite, the Sozin Attack; and finally the wild Velimirovic Attack, and no work on the Classical would be complete without a study of these fascinating variations. The Grand Prix Attack is one of White's most aggressive ways of fighting the Sicilian. It leads to a sharp, complex battle from the very beginning, and White's play is characterized by its lightning attacks against the black king. The opening became a powerful weapon to use in the cut and thrust of weekend tournament chess, where victory is everything and draws are not enough. It steadily became more popular and even gained the seal of approval from some of the world's elite such as the UK's top two Grandmasters, Nigel Short and Michael Adams, who have both utilized it with success. Everyman Chess's Starting Out series has firmly established itself as the leading guide to studying openings for upandcoming players. These books are distinguished by their easytoread layout, the lucid explanations of the fundamentals, and the abundance of notes, tips and warnings to help the reader absorb vital ideas. 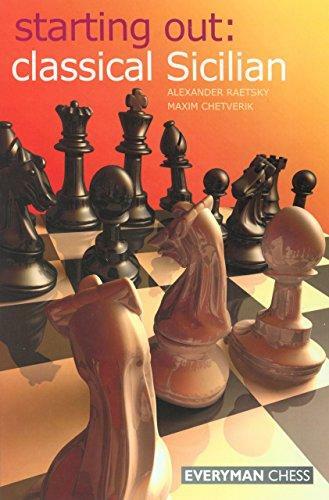 Starting Out opening books are ideal for enthusiastic chess players who have little experience of the openings in question and who wish to appreciate the essential principles behind them. Softback 176 pages.